I left an item behind in the cottage. The staff was very friendly and promptly mailed the item back to me in Texas. 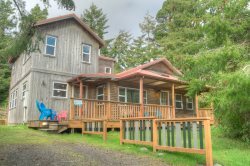 This beautiful home had everything you would want for a stay in Manzanita. The house is beautifully furnished, the beds and linens very comfortable, the kitchen fully stocked and the location was great. It has a large deck looking out on the back of the property that is very secluded with gorgeous tall trees. There is also a great grill on the deck we enjoyed. TV and interenet connections were easy to use and worked perfectly. Couldn't recommend Beachcombers Cottage more highly. Wish I was there now! This was our first trip to the Oregon Coast. We live in Texas and visited in August and the weather in Manzanita was fabulous. We loved the coast and the beautiful forest hikes close to the cottage. We will definitely return to Beachcombers Cottage! Beachcombers Cottage was amazing! A warm, inviting "home" for my stay in Manzanita. I enjoyed cooking in the immaculate, well-stocked kitchen. Nice walk to the beach and into town. The woods in the back made for a relaxing atmosphere on the deck and in the family room. My dream would be to return each year! The cupboard door left of the stove to lazy Susan needs hinge repair. The large serving spoons had bendy handles. Nice walking distance to beach but out of the busy part of town. We enjoyed having the bbq. As stated above, it was an excellent retreat. Some baking soda sitting in the fridge wouldn't do the ice any harm. That is all. Thank you!